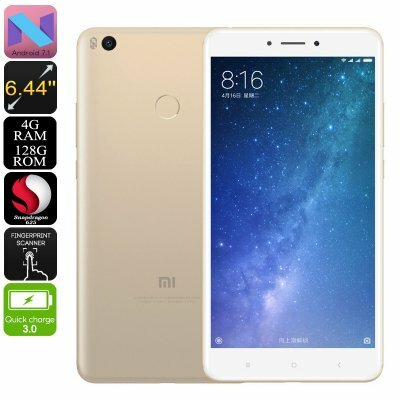 Successfully Added Xiaomi Max 2 Smartphone - 128GB Storage, 4GB RAM, 8 Core CPU, Android 7.1, Two SIM, 4G, 6.44 Inch Screen, 5300mAh Battery (Gold) to your Shopping Cart. Maximum features at minimum price appears to be the mantra at Xiaomi. Nothing shows this more than the Max 2 smartphone. With the latest Android 7 operating system, a Snapdragon Octa Core CPU clocked at 2.0GHzx and 4GB of RAM you get a seamless performance. There is a massive 128GB of internal storage so you can make the most of all that the Play store has to offer. If you're looking for an Android phone that is great for movies and games then the 6.44 inch display of the Max 2 phone makes it a real winner. With full HD resolutions you can enjoy crisp images with vivid colors that offers a cinematic experience where ever you go. So whether your into games, love movies or love to browse the web then look no further than the Xiaomi Max 2. 4G connectivity and Dual-IMEI numbers you can keep connected at all times. Providing great network coverage you'll be able to run two numbers simultaneously through this one device. No more roaming charges or network black spots as you run two SIM cards at once. This is also a treat for the busy professional who would like to untangle their business and private contacts without having to carry two smartphones around. A 12MP camera on the rear of this smartphone brings exquisite photos and lets you record video in breathtaking 4K quality. 128GB of internal memory means there be plenty of space for all your videos and memorable moments. A fingerprint scanner makes secure access just a touch away, no more passwords or screen codes just press your finger to the phones fingerprint scanner and your granted access right away.